Happy Pink Saturday again! I'm posting today because tomorrow I'll be on my way to southern California for my mother-in-law's 86th birthday. She's a cute, spry, little lady who is so much fun! I hope you all have a wonderful weekend and make sure to go visit sweet Beverly for more Pink Saturday posts! I've been trying to limit myself to time on the computer so I'll try to make this a short post. Monday's surgery went well. It was painful but by Tuesday morning I was free from eye pain. I've been spending a lot of time in my bedroom. My desk sits on the wall across from the foot of my bed and I have this beautiful inspiration board hanging above it. I'm sure some of you will recognize the beautiful artwork that you've sent me. It's inspired me to do lots of dreaming about creating and not much creating. I also have this shelf over my closet. It doesn't get dusted much because I have to climb up a ladder to get to it. Sunday night, I decided to take everything down, vacuum, and rearrange. The adorable lamb planter was a recent estate sale find. I told my hubby that I'm collecting this stuff for a future grand baby. So far I've gotten away with it. ;o) My bedroom has turned into a good place to sit and stare and daydream. Speaking of dreaming, I've been reading the beautiful, beautiful book, The Private World of Tasha Tudor. 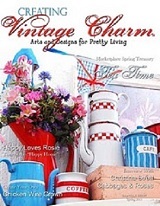 It is filled with gorgeous pictures of Tasha's illustrations, gardens, vintage clothing and collections. Tasha would have been 93 tomorrow. Victoria magazine also has a tribute to Tasha Tudor in September's issue. I could spend hours imagining a Tasha Tudor lifestyle. As for Tasha, what an amazing woman! She probably didn't spend a whole lot of time sitting around daydreaming. Look at these sweet treasures. The little blue and white saucer was bought at the thrift store for me by my best friend. She knows me so well. The other saucer, the pile of vintage doilies and the hanky bag were found in a chest at an estate sale. I love this little yo yo bag. It needs a tiny bit of repair and it is missing a few yo yos but it is so cute! I'll probably mend it and then hang it on a hook in my bedroom so I can look at it every day. I'm using some of the doilies for some new ideas I have for Lollishops. This is the beginning of a chenille cake with a doily top. It isn't finished yet. I have to put more stuffing and finish out the bottom. I hope you will forgive me for comg here to share my trials. I found out on Friday that I need more eye surgery for my diabetic proliferative retinopathy. This afternoon will be my fifth surgery. It is back to the torture chair for me. I am trying to be upbeat about it. The doctor has turned out to be a very sweet and compassionate woman. When I first met her, I thought she was arrogant and unfeeling. I have come to realize how badly she wants to save my sight. I am doing everything I can to keep my blood sugar levels down. When I first started having the surgeries my A1C blood level was 9. Now it is 6.5, which is almost normal for a nondiabetic person. That means lots of sacrifice. No desserts. No bread, pasta or potatoes. I think I may have turned into a 5'6" rabbit! I've also lost 27 pounds! So, I may not be here for a few days. I'll catch up with all of you as soon as I can. Happy Pink Saturday! I thought I'd share some of my favorite pink pictures from the last year and a half of blogging. I have a a slight fondness for pink! For more beautiful pink posts go visit sweet Beverly and find a link to all of the other Pink Saturday participants. It's been a while since I took you for a drive. Since the gas prices are so high, we'll take a short drive to the foothills of Clovis. Right now our foothills are covered with dry grass and oak trees. If you don't mind the lack of green, it can be a pretty drive. We've been passing this fence for years. It is quite a piece of sculpture. Some people call it junk art. I'm glad we stopped. I've always liked the cowboy playing the guitar but, I never noticed the coyotes, the funky birds made from propane tanks or the 15 foot long rattlesnakes. Look at this, there's even an old sewing machine in the design. Quails Lakes is a gated housing development. If you'd like to live there, there's a house for sale right now for a cool 1,395,000. Just your basic four bedroom ranch style with your own 20 acres of dry grass. Did you notice I finally made myself a banner? Would you believe that I put if off because I was afraid I might delete my whole blog? I still want to play with the colors for the links and captions but for now it will do. I don't know why it isn't centered. I really think I need to take a computer class this fall. The photo of the little girl was a gift from my friend Jen at Kahshe Cottage. It could have been me though. I taught myself to sew on my mom's old sewing machine. I did some sprucing up around the house too. I've been looking for blue sheers for my living room window. I looked on line. I looked at the linen supply. I looked for just the right blue dye. I couldn't find what I wanted. Saturday, I was next door to KMart and thought I would check and see if they had any sheers. Oh Martha! Isn't this a pretty color? Martha Stewart brand and only four dollars a panel. Woo Hoo! I hung my pretty banner from Becky over the top. I'd show you the whole living room but it really looks like a recording studio. The fan is a necessity. We could have financed a trip to the Mexican Riviera on just the cost of our electric bill this summer. Look what came in the mail today. Vicki at Turkey Feathers had a giveaway and I won my choice of her patterns. I picked this cute potholder pattern. When I visited Vicki's blog to say thank you, I saw these adorable bakery treats made by her daughter. I think I have a new obsession. My little cake is so cute. I told my hubby that I need a doll house now. That way I can still satisfy my collector bug and contain it to a small area. Makes sense to me! A thing of beauty is a joy forever; its loveliness increases; it will never pass into nothingness. Another Pink Saturday at Beverly's! I thought I'd just show you a touch of pink today. A pretty new pincushion with a perfect pink rose. A sweet little pink jar that once held the secret to beauty. Tiny pink roses on a beautiful vintage scarf. The sweetest little pink box found with near new pinking shears inside. Go visit Beverly and all of her pink friends and have a wonderful pink weekend. Look at this pretty award. Linda at Somewhere in Time gave it to me a few weeks ago. I'm going to combine it with the Tree of Happiness award from Melody at My Little Blue Cottage. You're supposed to share six things that make you happy. How about buttons? 1. Buttons make me happy. 2. Making pincushions makes me happy too! 3. My hubby makes me happy unless he's tired and cranky and in a bad mood (wait, maybe that's me). 4. My kitty stopped ignoring me today and that makes me happy too. 5. My kids make me happy. How did I get so lucky?! 6. My blog friends here make me happy. I'll pass both of these awards on to these five ladies but I think each and every one of you deserves them too. and just this once I want to give it to a lady who doesn't have a blog but should and deserves these awards. Janice...this ones for you too! Do you remember that song by Billy Preston? I woke up this morning with it in my head. What's weird is that I had just had a very vivid dream that had nothing to do with that song. I dreamed that I was in the hospital and everyone was looking for "The Girl". They were trying to find her so that I could get a blood transfusion from her. The doctor's were all saying that it was the only cure for me. Now, I think my dream stems from two things. I finished Stephenie Meyer's latest book, Breaking Dawn. (All about vampires and werewolves) I loved it. I'm sorry the story has come to an end. The second thing was that I was talking to my brother-in-law on the phone last night. He asked me what caused my latest health problem. I told him that I just think it is part of turning 50 next year. Maybe I could start aging backward. There was a 49 year old woman racing in the bike race at the Olympics. If she can do that I should at least be able to work out five days a week. First though, I'll need to get out of this chair. I don't get colds. I never get the flu. My children can have raging sore throats and I won't get one. So, Tuesday, I was playing cards with my youngest son and my nieces and I started feeling a little funny. I didn't feel really well but I went to bed without saying anything. By five in the morning, I felt like I had been head butted by a grizzly bear. I was hunched over my computer looking up symptoms of lower right abdomen pain when my son was leaving for work. He wanted to take me to the hospital but I wouldn't go. By eight, I was calling the doctor and he had me come right in. After lab tests and a CT scan, my doctor wanted me admitted to the hospital for colitus and diverticulitis. I only knew that I could barely stand up straight and my tummy hurt like heck. Now, if you live in the United States you know we have a health care crisis. We arrived at the Clovis Community Hospital and the ER looked like there had been a major accident in our area. Every chair in the waiting room was full. There were rows of chairs filled with people in the hallways. It was really standing room only. My husband works for the main hospital in downtown Fresno, but he knew many of the people working and they managed to get me in and on to a gurney within a few hours. I stayed on the gurney in the hallway for hours. The doctor examined me right away and a specialist was called in. The specialist, who my husband had never met before, declared my husband a well-respected therapist and wanted me admitted right away. The problem was that there were no beds available at the hospital. So, I sat on that gurney for hours. When a nurse friend of my husband finally found me a bed in a dark corner of the ER, it was about four in the morning. I thought maybe I'd get some sleep. Hah. In came a man (same room) and he proceeded to get sick every where. I won't go into more than that. It was awful. I have never had more respect for health care workers after spending 15 hours in an ER. How they cope with the smells, the crying, screaming and craziness is beyond me. The same specialist showed up around nine in the morning. He wanted me to stay another 24 hours so they could "watch me". But, again the hospital was full, so I would have to continue to stay in the ER until a bed was available. I convinced him that I had my own personal health care worker (who is perfectly capable of "watching me") and he reluctantly let me go home yesterday. This morning I can walk straight up with only a slight bend. I will hopefully be back to normal in a few days. In the middle of all this craziness, a box arrived in the mail. I won a giveaway at Becky's Sweet Cottage Dreams. Becky sent me this wonderful package of pink goodies. I can not wait to hang the pretty banner that Becky made and find a place for that painting. I love every single treasure Becky packed into that box. Thank you so much sweet Becky.